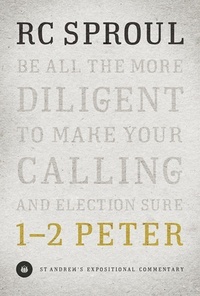 Peter wrote two letters to encourage churches to stand firm under persecution. The apostle Peter himself was familiar with persecution, as he probably wrote the letters from Rome, awaiting his death. From his own suffering Peter joins in fellowship with “elect exiles of the dispersion” by urging them to “rejoice, though now for a little while … you have been grieved by various trials.” His inspired challenges to live a life worthy of the gospel hold great relevance for us today. Pastor and scholar R.C. Sproul has preached through Peter’s letters and has now compiled these sermons into one volume. This St. Andrew’s Expositional Commentary will enable readers to glean from Sproul’s wisdom and perspective on 1–2 Peter. The St. Andrew’s Expositional Commentary series is the result of years of careful preparation and Bible-centered preaching. Delivered from a pastor’s heart for his congregation, readers will find this volume readable, applicable, appropriately paced, and thoroughly biblical. Here is an opportunity to sit at the feet of an eminent scholar and teacher, encountering the Word of God. Volumes on John, Acts, and Romans have already appeared.